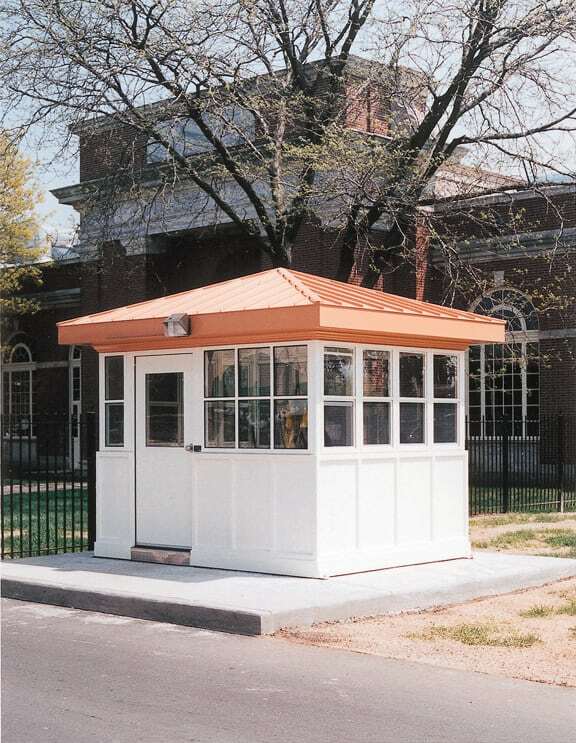 Pictured here is an Information/Security booth located at a highly respected local museum (Henry Ford). They selected the “Presidential” style with the colonial look to blend in with the site and surrounding buildings. Visible features of the building include metal standing seam hip roof, crown molding, colonial style window mullions and architectural raised rib wall treatment and larger trim base. Internally, there is a custom plastic laminated counter, tiled floor, recessed duplexes, blank raceways for communication lines, appropriate HVAC system for the climate and exterior flood lights with wall switch to keep the area lit as evening approaches.